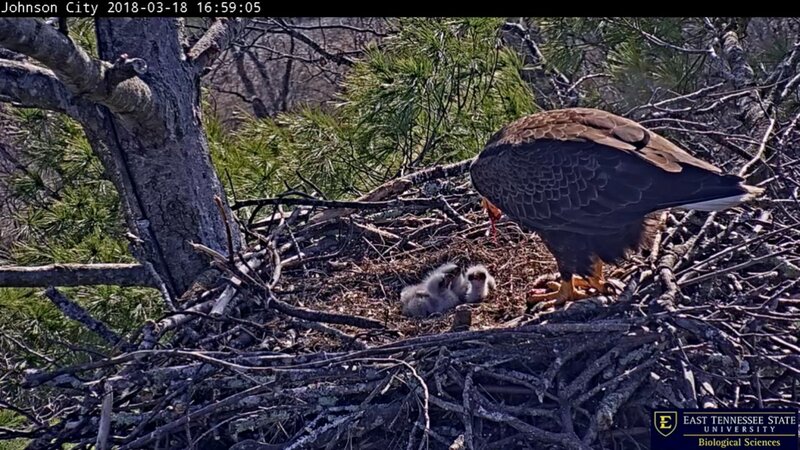 Nori and Shima, the two stars of East Tennessee State University’s Eagle Cam in Johnson City, nested for the sixth year together, and the result is three new eaglets. The three eaglets hatched last week, and ETSU’s Department of Biological Sciences’ live-streams captured it all for viewers. The relationship between the parents and eaglets is a much quicker one than humans experience. The eggs were laid in mid-February, born mid-March, and the eaglets will be ready to leave their home completely by late July. Because the process is so quick and the eaglets will leave soon, they have not been named. JC10 was born on Monday, JC11 on Tuesday, and JC12 on Thursday. Each will leave the nest around 12 weeks. Until then, Nori and Shima will continue to care for them. According to Alsop, Nori and Shima’s names were chosen by popular vote in a competition. Nori means “father,” and Shima means “mother.” This mother and father have mated for life and return to Johnson City to prepare for nesting in November. It’s rare for Bald Eagles to lay more than two eggs, and in previous seasons Shima has only laid two eggs. The Department of Biological Sciences is excited to be able to share this nesting season with everyone. Viewers can watch as the eaglets grow by visiting the live-stream link at https://www.etsu.edu/cas/biology/eagle-cam/. More information, such as frequently asked questions and facts about Bald Eagles, can be found on the live-stream website.